Sen. David Vitter on Thursday made good on an earlier threat to place a hold on President Obama’s nomination of Beth Cobert to move from acting to permanent status as director of the Office of Personnel Management. “Time for OPM to Fess Up on Washington’s Obamacare Exemption,” Vitter proclaimed in a statement declaring that he will block her confirmation floor vote until Cobert responds to his request for information. At issue are internal deliberations that led up to OPM’s October 2013 decision to allow congressional staff to obtain health insurance without using the District of Columbia’s exchange for individuals. 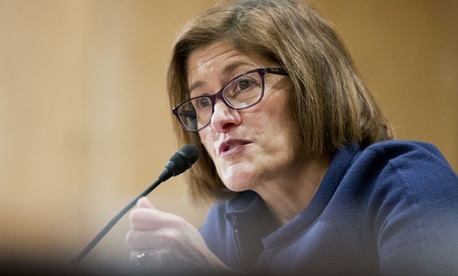 Cobert, whose nomination cleared the Senate Homeland Security and Governmental Affairs Committee on Feb. 10, also faces a challenge to her eligibility to serve as acting OPM director since her agency’s inspector general published a legal interpretation saying her November nomination negated her subsequent actions running OPM. She also faces a subpoena from the House Oversight and Government Reform Committee seeking more documents on the June 2015 breach of OPM online personnel records. In his Feb. 24 letter to Cobert, Vitter asked Cobert to clarify whether Congress is considered a large or small employer under the Affordable Care Act—a query he has also directed at the Internal Revenue Service, which recently sent congressional employees a tax form labeled as being for large employers. Asked to comment, an OPM spokesman referred to comments made Thursday morning at a House Oversight and Government Reform Committee hearing on security clearance reform. Cummings focused on broader political motivations. “As we all know, Republicans are threatening to block anyone the president nominates to the Supreme Court—for political reasons,” he said. “In the same way, they are stalling Ms. Cobert’s nomination despite the fact that she has been widely praised for turning things around at the agency.” He quoted praise for Cobert from Senate committee Chairman Ron Johnson, R-Wis., and now-departed OPM Inspector General Patrick McFarland. Vitter, who chairs the Senate Small Business and Entrepreneurship Committee, ran unsuccessfully for governor of Louisiana last year and had declined to seek reelection to the Senate this year. Eric Katz contributed to this report.